During an interview about a proposed “trigger” to stem tax cuts if the budget deficit unexpectedly widened, Rep. Jeb Hensarling (R-Tex.) 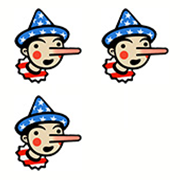 made a reference to economic history that caught The Fact Checker’s attention. Hensarling, chairman of the House Financial Services Committee, dismissed the trigger as a “uniquely bad idea” because it would leave businesses uncertain about their tax rates. Moreover, he predicted that “we will be able to fill any deficit hole with additional revenues,” citing the tax cuts engineered by Calvin Coolidge, John F. Kennedy and Ronald Reagan. He said that if a deficit widened, it could be handled with spending cuts, but he indicated he was not worried. In making this claim, Hensarling is relying on the past when the present offers little support for his position. So what does the economic history show? We’re going to focus mostly on the Reagan era, as that is more recent and probably more relevant. The Coolidge tax cuts were almost a century ago, when the United States was just emerging as a world power and did not have much of a welfare state. Even the Kennedy cuts came before the creation of Medicare and the expansion of Social Security, which has boosted payroll tax collections. All three tax cuts involved significant reductions in individual income tax rates — which is not a feature of the current tax legislation, though corporate rates would be significantly reduced. These cuts were engineered by Treasury Secretary Andrew Mellon under President Warren Harding, who died in 1923, and Coolidge. The top tax rate was 77 percent (for income above $1 million) and then was sharply cut in a series of tax acts in 1921, 1924 and 1926. Eventually the top tax rate fell to 24 percent by 1929. De Rugy said the tax cut removed 3 million people from the tax rolls and incomes and gross domestic product rose until the stock market crash that led to the Great Depression. “It seems like the tax cuts indeed made the tax code more progressive and had some positive effects on revenue overtime and the economy,” she said. The economy also boomed after the tax cut, but the cause and effect is disputed. When the Congressional Budget Office examined the question in 1978, it concluded that “most of this rise [in revenues] was due to economic growth that would have taken place even without the tax cut.” The tax cut reduced revenues by $12 billion on an annual basis, but CBO models indicated that only between $3 billion and $9 billion was recaptured through additional revenue. Reagan inherited the 70 percent top tax rate and, through the Economic Recovery Tax Act of 1981, slashed it to 50 percent. His 1986 tax overhaul brought the top rate down to 28 percent, but we will focus on the impact of first tax cut because the second one was designed to be revenue-neutral. A complicating factor is that although Reagan cut taxes in 1981, he also raised taxes 11 times during his presidency — including major hikes in 1982, 1983, 1984 and 1987. A Treasury Department analysis of the impact of tax bills since 1940 found that the tax increases helped make up more than half of the revenue loss in the 1981 tax cut. This record makes it all but impossible to determine how much of the 1981 tax cut was actually recouped with revenues generated by the tax cut. But we can also look at what officials believed at the time — and it turns out that Reagan officials did not believe the tax cuts would pay for themselves. Bruce Bartlett, a former Treasury Department official who helped craft the 1981 tax cut as a congressional aide at the time, in a 2011 article for Tax Notes reproduced the Reagan administration and CBO scores of the Reagan tax plan. Both predicted revenues would fall as a result of the tax cut. But both estimates turned out to be off the mark about the extent of the fiscal impact because the 1981-1982 recession turned out to be deeper than expected and inflation fell more rapidly than expected. That steep decline in revenues is a major reason why Reagan boosted taxes just one year after his tax cut. Reagan’s own 1990 budget, his last one, concluded that the “net effect” of 1981 tax cut was a reduction in revenue by $613 billion over five years; all but $367 billion was recouped by Reagan tax increases, the budget document said. This estimate was made in 1988, meaning it incorporated whatever growth occurred in the 1980s. There is little dispute that tax cuts will promote economic growth. But contrary to Hensarling’s claim about “economic history,” there also is little support for the idea a tax cut “will be able to fill any deficit hole with additional revenues.” Hensarling, like many Republican boosters of the tax cut, suggests a tax cut means a free lunch. But that’s simply not the case, based on the available data. Hensarling, to his credit, acknowledges he would seek to cut spending if the deficit got too large, rather than raise taxes as Reagan did. But he should not suggest economic history provides enough evidence that such difficult choices will not be necessary. His certitude suggests Four Pinocchios, but given that history involves uncertainty and interpretation, we will keep it at Three.